A Japanese knitter from the late 1800's. With thanks to Beadlizard for being smarter than I am, I give you an amazing explanation of this image from my friend Alfred the ultra-knowledgable wonder weaver and worker of magic with silk. "My guess, based on the fact that she is wearing a furisode (kimono with long, flirtatiously flappy sleeves) means she's unmarried; the fur collar piece extravaganza is still worn by unmarried-but- eminently-marriageable young ladies at New Years (they use white fur nowadays though), for shrine visits, and photography sessions. 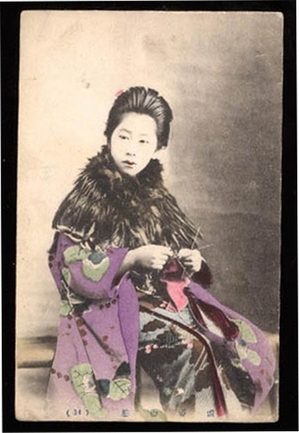 The fact that she's knitting not only means that she's industrious and therefore marriageable, but also frightfully up-to-date, since knitting in Meiji Japan (1868-1912) was All the Rage as with many things western. I am pretty sure that knitting made its initial appearance in Japan with the arrival of the first Europeans in the second quarter of the sixteenth century, but as far as I know it didn't 'stick' until the Meiji period. Based on what I know about the period and the sartorial landscape of the time (there was a lot of change during that period, clothingwise), I would guess that your Marriageable One gussied herself up and posed for the shutter-click sometime between 1890 and 1900. Also, she doesn't shave her eyebrows and has a simple pompadour (rather than one of the several de rigueur traditional hairdos) which means that she's slightly westernized. Her face is powdered chalk white, another sign of wealth and class. Merchant class, as they were not allowed to embroider their kimono (sumptuary law), but inventive people with money to spare can always find a way around sartorial edicts, so enter Yuzen-zome*, a dyeing technique, which later became exalted and refined, and today is considered rather more elegant than the embroidery and brocading it was originally meant to imitate. She would be anywhere from 16-20 in this photograph, which almost certainly was used by marriage brokers to show to potential suitors. *Yûzen-zome could be described as a masterful technique which utilizes both stenciled paste-resist and the technique of painting dyes directly onto mordanted fabric. It developed in response to the sartorial edicts of the Tokugawa shoguns, who ruled Japan from 1600 until 1868. The merchant class, who by then were the cash-richest people in the country at the time, had been 'aping their betters' in mode of dress, wearing fabrics rich with gold, embroidery, and brocading. There were forbidden colors, as well. The pissed-off shogun issued the sartorial edicts beginning (I think I got this date right) in the second quarter of the eighteenth century after a period of fairly wild abandon during which the merchants had become wealthy enough to become the arbiters of mode. Brocades were now forbidden to anyone but the kuge, or noble families; embroidery was forbidden to anyone below the rank of samurai, which included farmers and merchants, respectively. The merchants, of course, obeyed, to the letter of the law. But they were still the richest people in town, with taste, and they turned the tables on the sartorial edicts by holding fast to their position as society's fashionistas by investing buckets of money in labor-intensive craft techniques. Yûzen-zome was developed by some genius in the Yûzen family. Can't embroider vines with Convolvulus blossoms on your fabulous new kimono? The craftspeople would stencil-resist a vine, which would then appear after the piece was dyed and washed, as negative space. This in turn would be painted carefully and laboriously outlined in crisp black hair-thin lines painted along the edges, and then a wide palette of hues would be 'embroidered' as in-fill within those lines, by painting dyes onto discrete areas of that fabric. The results were breathtaking and became All The Rage, leaving the heavily-embroidered upper classes left looking like gaudy fashion has-beens." That was great!!! Me things it's kind of a Japanese version of To the Manor Born. As the great melting pot, I'm not sure we ever had that, but sometimes I'm sorry because we're a little short on tradition, unless you count the spending frenzy at Christmas. Fascinating info...thanks for sharing it. Knowledge is wonderful. How much more can you see of that girl's life, knowing what Alfred has taught us? This is what I was always looking for in history class and rarely finding, these details that breathe life into the past. Oh, thanks for the update! So interesting. Now I'm off to look up yuzen zome as I think I need to learn how to do that! Many thanks to Alfred for the updated version of the post. Excellent info and history - it adds so much more to the story. It's likely she's a Geisha or a bride and she's dressed for cold winter weather. Oh, very cool (is that a sock?). I just want to know what the thing around her neck is. Inconsistent, for sure. Hard to wrap my brain around. I am happy that I have rediscovered your site! Definitely one of your most interesting finds, Marcy. I'll see if Alfred can shed some light? Yes, it is a surprisingly informal pose for the time. BTW, I always dress just like that when I knit. I'm trying to figure this situation out. She looks like she is dressed for a formal portrait. But then why bring her knitting? Was it one of those things that showed wealth, talent, or social status? It looks like she's making a plain sock. Was she just snapped in this pose while waiting for the formal portrait? I'm such a nosy-posy, I want to know the story behind the picture. Me too, I'm not nearly fancy as that! Wow. I'm going to have to start dressing up to knit.